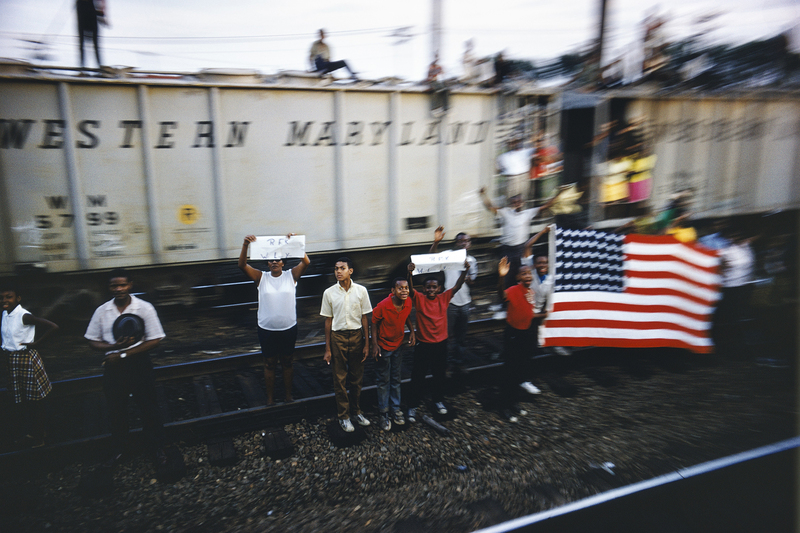 Paul Fusco, "Untitled," from the series "RFK Funeral Train," 1968, printed 2008; San Francisco Museum of Modern Art, purchase through a gift of Randi and Bob Fisher, Nion McEvoy, Kate and Wes Mitchell, The Black Dog Private Foundation, Candace and Vincent Gaudiani, Michele and Chris Meany, Jane and Larry Reed, and John A. MacMahon;. Copyright Magnum Photos, courtesy of Danziger Gallery and SFMoMA. How do we grieve? How do we grieve for someone we did not quite know? And how do we preserve that grief? Kennedy’s body was flown back from California to New York. A service and mass was held in a Manhattan church from Friday night to Saturday morning. At 12 p.m. on Saturday, Kennedy’s body was transferred to a train and left New York en route to Washington, D.C.. Robert — or “Bobby,” as many knew him — came to rest in Arlington, Virginia, next to his brother John. To record the momentous event, “Look” magazine sent the Magnum photojournalist Paul Fusco to take photographs of those who came out to bid Bobby goodbye. A selection of the hundreds of photos Fusco took is currently on display until June 10 at the San Francisco Museum of Modern Art in an exhibition titled “The Train.” Fusco’s photos are being shown alongside “June 8, 1968” (2009), a film by the French contemporary artist Philippe Parreno (He recreated the train trip in cinematic form. ), as well as photos of the train taken from private collections by Dutch artist Rein Jelle Terpstra. Fusco’s images arrest the viewer’s attention in their Kodachrome colors. At first, the vivacity and range of Fusco’s color palette seems out of place. Funerals are usually somber affairs: cold, gray, rainy. Fusco’s photographs are not. Bobby’s train rolled along in tepid June heat, while Fusco’s Americans reflect the sun: white rounded collars, shirtless children, striped t-shirts. He captured the atmospheric swelter of an early New England summer afternoon. The viewer is met with intense greens, yellows, reds, pinks, blues, auburn bricks, white pastel fencing. In one photo, the people gathered in a lush green forest look less like dour mourners and more like the tucked-away picnickers of Edouard Manet’s “Le déjeuner sur l’herbe.” These Americans do not color their public grief in somber blacks. They individualize themselves even as they mourn. A girl’s swimming gear becomes mourning wear, while a boy’s shirtless chest serves as his own homage to Bobby’s youthful vigor. The memories these photos conjure up are colored by sweet summer greens, non-violent reds in the golden hour — yet with a lingering dusk creeping up, a layer of sadness emerging. Paul Fusco, “Untitled,” from the series “RFK Funeral Train,” 1968, printed 2008; San Francisco Museum of Modern Art, purchase through a gift of Randi and Bob Fisher, Nion McEvoy, Kate and Wes Mitchell, The Black Dog Private Foundation, Candace and Vincent Gaudiani, Michele and Chris Meany, Jane and Larry Reed, and John A. MacMahon;. Copyright Magnum Photos, courtesy of Danziger Gallery and SFMoMA. The blurs in Fusco’s photos create phantasmal effects as well. Fusco’s hundreds of photos (only 21 are on display in “The Train”) pulsate with these blurs, the result of the camera panning alongside the moving train. Fusco’s mastery of his camera is revealed in these blurs: The Americans turn into action-painting globs. The thick late-afternoon. New York in June. An American public in motion, even as it is grindingly still. Fusco’s blurs preserve the zooming motions of the train — almost as if his photographs so resist their static nature that they are trying to enter the realm of the cinematic, of even real-moving life. The specter of brother John hangs over the Fusco photographs. His blurs conjure up memories of Abraham Zapruder’s film of the assassination of John F. Kennedy on November 22, 1963. In both the Zapruder film and in the Fusco photographs, space is anchored by silent, rolling, green lawns. We see the blurred shots of people in confused movement, a grief that is still being processed. Fusco’s photographs look like the cleaned frames of the Zapruder film. The witnesses to JFK’s murder are reacting in real time (They do not yet realize what has happened. ), while the funeral train mourners are still trying to internalize their grief 48 hours later. In both, Americans are forced to face events of a barbarous nature — traumas they can’t understand. And as James Baldwin pointed out, the source of the barbarity is within them, within their own society. With the ‘60s progression from Zapruder to Fusco, a circle of political assassination is closed: an instant tragedy and a long-lasting confusion. All of this is preserved on film, lending the events a horrifying truth. In the Fusco photographs, truth also comes out of repetition. The photos hardly seem to change: They are all from the same angle (atop an elevated, moving train), their effects become familiar after you’ve seen two or three of them and their subjects are endless. The monotony of Fusco’s photographs is Bressonian: a gesture repeated over and over and over again until it gains a ritualistic purity. On June 8, 1968, Paul Fusco could have taken an infinite number of photographs aboard that train — and they would have all been stellar. They were captured in a fresh moment, and, at the same time, they were hardening into the annals of history. “The Train” instills a sense of stubbornness in the viewer. But it is not because of the photos’ sameness; it’s due to their paucity: We wanted more variations, more faces, more mourners. Whence comes this desire? Why do we seek more, having already glimpsed a purported selection of “the best” and “the most representative”? There’s something soothing about the constancy of things in the midst of clamorous chaos. The following two-thirds of the SFMoMA exhibit chart a different course. In an approach physically opposite to that of Fusco, Dutch artist Rein Jelle Terpstra presents a collection of curated private images. Mapped along the wall, the pictures are personal photographs, lent by the American public in attendance. Terpstra’s project thus mirrors Fusco’s: While Fusco captured an American public, Terpstra’s collection is what that American public saw and made a point of remembering: themselves. Lining the walls are small framed photographs, as well as some home videos, ranging in content from the bleary, metallic train itself to the backs of people watching it go by. The pictures lack the formality, the clarity, the mastery of Fusco’s. But they offer the same truth. As Fusco documented an American grieving, so do these images but from another side of the tracks. Supposedly, the film following, “June 8, 1968” by Philippe Parreno runs a similar note to its prior presenters. We, however, wouldn’t know, as the film was broken on the day we attended the galleries of the museum. The grief on display in all the photos we saw is distinctly American, inexorably tied to the violent history of the 1960s — as leaders rose and were cut down in their prime. After their fall, the question Martin Luther King, Jr. posed in 1967 resonates loudly: “Where do we go from here?” The answer, as King and Paul Fusco posit, is in the people. And in all of these faces is preserved the truth of 1960s grief on film. Further, this truth is one that does not fade — it persists, it invades, and decades later, mounted on the walls of SFMoMA, it still pervades the imagination of a new American public. Edit: A previous version of this article incorrectly listed the number of Paul Fusco photos on display. Contact Mac Taylor at ataylor8 ‘at’ stanford.edu and Carlos Valladares at cvall96 ‘at’ stanford.edu. Mac Taylor grew up an avid reader and writer amidst the mountains of Aspen, CO. Now a sophomore at Stanford, Mac is majoring in Art History and minoring in French. When not skiing or hiking, she enjoys eating good cheese, reading Rimbaud, and running in circles with her two yellow Labradors, Jack and Trout.